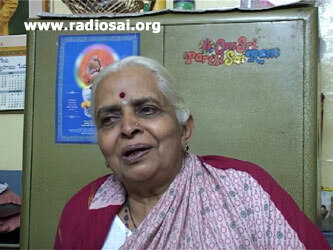 In the last issue we had the final part of the over one-hour long conversation between Mrs. Padma Kasturi (commonly called as Padmamma), daughter of Sri N Kasturi, Swami’s biographer and Ms. Rajeshwari Patel, an alumnus of Swami’s University and now a faculty member in the Anantapur campus of Sathya Sai University, which was aired on Radio Sai a few weeks ago. Now we have the first part of the second interview with her. Rajeshwari Patel (RP): Aum Shri Sai Ram! Welcome to Radio Sai Global Harmony. 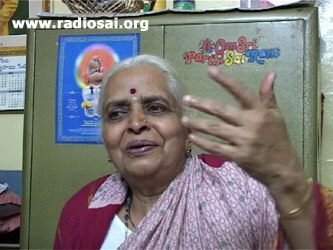 Mrs Padmamma is once again with us today to share some more of her own memorable experiences with Beloved Bhagavan. Welcome Ma’am to the studio of Sai Global Harmony. I felt a joyous sense of belonging in your voice. I realized that your life is so very much tied to Bhagavan and to this place. So, I would like to begin this session with a question relating to this. 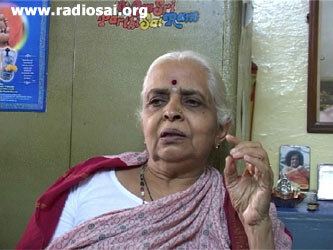 Please tell our listeners about ‘your Prashanti Nilayam’ as you called it. What was it like in those days? What was the daily routine? PK: It was just like a bungalow and not like the current Mandir. In front there was a huge garden with coconut palm trees, and mango trees too. There were tiled houses on both the sides and there was some space in between. In those days, it was a big problem to reach Puttaparthi. To reach Puttaparthi from Bangalore, first we had to travel for 3 to 4 hours by train, to a station called Penukonda. Then, from there we had to take a jhatka (horse-cart) to go from the railway station to the bus-stand in Penukonda. Then we had to travel in the bus to reach Bukkapatanam which is about 3 to 4 miles away from Puttaparthi. Then, we had to take a bullock-cart from there! The bullock-cart was something interesting, now when we think about it, but it was really hard when we had to come. RP: So you had to cross the hot sands? PK: Yes. And whenever the bullocks were to go through the sands, the bullock-cart guy would ask us to get off because the bullocks would find it very hard to walk on the sand with the luggage and the entire heavy load! And walking on the sand is very difficult especially when it is very hot and our feet would go in! We had to pull our feet out and people who were from the cities were not used to all this. RP: So how many hours of journey is it from Bangalore to Puttaparthi with all these different stops? PK: We started Bangalore at 9 o’clock in the morning and we used to reach Puttaparthi by 5 or 6 in the evening. And the best thing was that Swami would be there waiting for us. Whenever any bullock cart would come, He would be near the bullock cart to receive us. RP: Oh! So He was giving you a very warm welcome! PK: Yes, then we never felt hot from the journey at all! We would get His namaskar (chance to touch His feet) immediately and if there were any small children in the bullock cart, He would Himself hold them and take them out of the cart and would immediately come to the house and even ask us: “What have you brought for Me?” like a small child – a relative - you know! RP: How would Swami come to know that you were arriving? Or did He always know? PK: He always knew of course, but whenever some bullock cart came, He was always there to receive. So it was always a wonderful experience coming to Puttaparthi. RP: What was the daily routine like? I mean what time would Darshan begin or there was no such timing? PK: When we would come here, there was no suprabhatam or nagarsankeertan or anything like that. We could get up late in the mornings and there were not that many people for interviews either. There were no token lines, and people who wanted to leave that same day, they would be seated in the veranda. RP: Nowadays, there are thousands of people even on ordinary days! PK: Yes. So people would sit on the veranda and the ladies would sit there and Swami would come down by 8 or something. RP: Are you talking of the new Mandir or the old one? PK: The new one. He would come at around 7:30 or 8:00 and He would stand near the interview room and it would be on a first-come-first basis in those days. RP: So everybody got an interview? PK: Everybody got an interview mostly. And we would make sure we got the interview the day we left because then we could take the prasadam too. RP: On a regular basis, how many people used to be there everyday on an average? PK: Average about 200 to 300, that’s all. PK: Oh! On those festive days the Mandir hall would be full! We used to say: “Oh! So many people! The hall is full!” and now everyday the hall is full! RP: Yes, more than full! So there was no routine as such? PK: No, no routine. Everyday the bhajans would be over by 11 or 12. Since there were not too many people, He didn’t have to go around. He used to come down and walk from the garden and place to place. RP: So you could have Darshan almost all the time! PK: Yes. And we could get namaskaram too – He used to allow namaskaram whenever He was walking around in the garden; or He would come home and sit with us and talk. RP: So there was a garden there? PK: There was a big garden with flowers and coconut trees and we ladies used to water the plants everyday - it was a routine. Since there were no taps or electricity in those days, a petromax light was used for the bhajans inside the hall. RP: But that was in the morning; what about the evening bhajans? PK: There were evening bhajans. PK: It was in between 6 and 7. RP: Oh! Were there interviews in the evening too? PK: No, not many. Interviews were in the morning mainly or during bhajans – as He wished. It was not a planned routine like these days. RP: So He was literally the Master of the place! PK: Yes. So anyway, since we didn’t have electricity, we had to draw water from the wells – there were two wells there – and we ladies used to gather between 4 and 6 in the evenings and we used to water the plants. Some strong ladies used to draw the water and we young ladies used to stand in lines and pass on the water pots from one to another. And some old ladies who could not carry the water, used to collect the empty vessels and put it away. It was a daily routine, from 4 to 6. RP: So only the women did the watering of the plants? 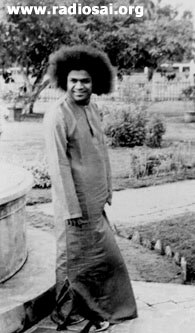 PK: Yes, and Swami used to sometimes walk around in the garden, and come and talk to us and after the watering would be done, sometimes He used to give us some fruits or some other prasaad – so we would really enjoy it. RP: You know, last time when you were talking about your father, you were saying that you were unfortunately not present when Bhagavan was going to take a picture of your father; and the photograph, of course, turned out to be a joke that He wanted to play on Prof. Kasturi. Were you at any time ever involved in any similar kind of incident? PK: Yes, I will tell you that! You see, there was another daily routine where after dinner we were allowed to go to His dining room. He used to come to the eastern side of the Mandir for breakfast, lunch and dinner. And one of His sisters used to serve Him. After dinner, we ladies used to go to garland Him. When jasmine season would be there, we would make beautiful garlands and He used to allow us to garland Him. Oh! We all were so excited! In those days, there was no colour film; so it was a problem for us to choose the saris to wear since the photograph would be just black and white. We were all ready by 8 o’clock in the morning and He had asked us to bring the pots too. RP: Just so that you can have the pots in front of you? PK: Yes. And He asked us to bring a big brass pot too and He wanted to sit on that in the center; He didn’t want a chair! We all went in - we were about 25 of us. My eldest son who was just 3 years old then, used to water the plants with a small brass pot. Swami asked me to bring him too and He asked him to sit in front of Him and we all were standing around Him. RP: Was he holding the pot too? 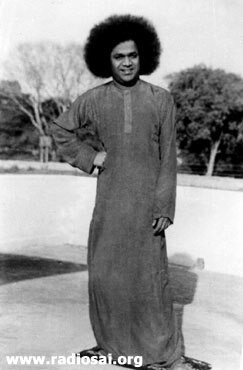 RP: So Swami didn’t even want the young photographer to look through the camera-box and take your picture? So the same thing happened; Swami went and focused it and adjusted everything and He came back and sat on the pot and said ‘ready!’ and my father clicked! RP: Oh! Then what happened? PK: We were all disappointed! But though we could not get the photo, the impression of that opportunity just remained imprinted in our hearts. We do remember that day and we were so happy that we got the opportunity. RP: That’s a beautiful experience! It is rather humorous, but it’s also very educative. What sort of message do you think Bhagavan was conveying? Because, apparently Bhagavan has not changed some of His view points of protection of women from the eyes of men; and that’s a very beautiful lesson. RP: I heard that you had several opportunities to have moonlit night dinners with Bhagavan? RP: Please tell us about that! RP: Oh! Mandir terrace? What about the sands of the River Chitravati? Did He take people there too? PK: No. These dinners were usually just on the terrace. RP: Oh! That’s good. So these were terrace-dinners? PK: Yes. Each family would cook their food and bring it and we would all go upstairs and sometimes Swami would order some people to prepare in larger quantities – some savouries or sweets. 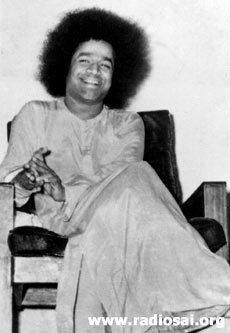 RP: What were the favourite dishes of Swami? PK: Oh, some wadas or bhajis. PK: Yes. And so those people would prepare that in larger quantities. In those days, there were hardly 25 or 30 families, and we - our families - used to sit in groups. Swami would serve that extra wada or bhaji or whatever they had brought. He used to serve it to everybody. And He used to bring His plate and whatever specialty we had prepared; we would serve it to Him too. He used to sit in the center, and we would all sit in a circle. In those days, there were no tape-recorders; but He had a gramophone record player, and He used to play some old Telugu drama songs. RP: Oh! There was music in the background too – like a party! What songs were they? Do you remember any songs? RP: Were they mythological ones? RP: I am sure you all liked that! PK: Yes. And after dinner would be done, we would do aarti to Swami. Once, He asked for an empty plate. Somebody gave Him an empty silver plate. He just hit the empty plate from the bottom and the whole plate was full of vibhuti! RP: Oh my God! And then He gave it to all of you? PK: Yes, He gave it to all of us. And we enjoyed the opportunity! I think I had these moonlight dinner parties at least twice or thrice; all are memorable! RP: With all these old songs playing in the background! That must be fun! What about on Ekadashi days? Were you with Bhagavan when He created amrita (nectar) and all that? PK: Yes! I was with Him many times – 3 or 4 times at least. There was one special Vaikuntha Ekadashi. 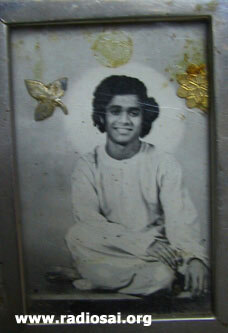 It was in 1957 – I remember that year because Swami celebrated my father's 60th birthday in the Mandir that year. And because my father was born on Christmas day, it was in December; and Vaikuntha Ekadashi usually falls in the end of December too. Swami took us all to the Chitravati River and said: “We will have moonlight dinner at Chitravati!” - It was very rare but sometimes we would have it. We all prepared food and took it there and Swami did some bhajans. RP: And the petromax lamp was taken along too? PK: Yes. We took that because by the time we would return, it would be dark and late; so we took torches because the roads were not like what they are today! PK: So after doing bhajans and giving some formal discussion – not a discourse – He would tell a story or someone would ask some question and it would go on. Then He asked my father to give Him a tumbler - which he always carried with him because sometimes Swami asked for some water. So when Swami asked for the silver tumbler, my father thought that Swami wanted some water and so he started to fill the tumbler with water. Swami said: “No. Give Me the empty tumbler!” Father gave it to Him and Swami held the empty tumbler near His mouth and then we just heard a burbling sound! RP: Oh, a gurgling sound? RP: Oh! Did He take amrita (nectar) out of His mouth? PK: Yes! That was the only time that I had heard of such a thing! Immediately there was a fragrant smell all over. RP: We have heard about Him taking the linga out from within but this is something rare! RP: Oh! He said that? RP: So the nectar container is in His stomach! PK: Yes. I think we were all very fortunate to get the real amritam from Him. A real amrita-kalasha! RP: And that too from Maha-Vishnu! And that too on such an auspicious day! PK: Yes. And He gave it too all. He never used to give amritam in our hands. He would pour it Himself in our mouth with a spoon! It was really difficult because we had to open our mouth wide right in front of Swami! RP: And then He would pour it! That’s good. Now, do you have any mementos of those early years? PK: Yes, I do have some. In 1954, for Shivaratri, Swami created 9 shivalingas and they emerged from His mouth; they were small but He had given one to my grandmother and she used to worship it and do abhishekam. RP: So is that with you? PK: Yes, that’s with me now. RP: Do you then also do the abhishekam? PK: Yes, I worship it everyday and do abhishekam. RP: So that’s the legacy that you have! 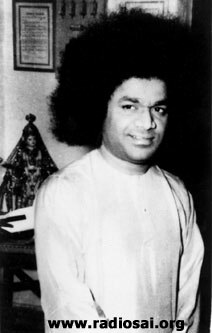 PK: And you would also know that when Swami went to Badrinath, He took out the lingam from the shrine which was installed by Shakaracharya and the lingam was worshipped with golden bilva leaves created by Swami. RP: Yes, we read about that in Sathyam Shivam Sundaram. PK: Also, when Swami went to Somanath, He created golden flowers and showered it on the lingam there. You must have read that too in the Sathyam Shivam Sundaram? PK: And there, He distributed the golden bilva leaves and the golden flowers to the devotees who had followed Him there. My father was one of the lucky recipients of that; I have both – one bilva leaf and one golden flower. RP: What have you done? Where have you kept it? PK: I kept it in my shrine. I stuck it into some photos in my shrine in my house. 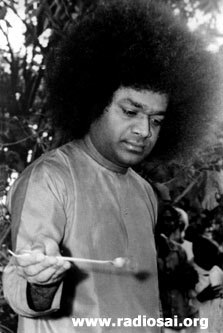 And in those early days, Swami used to chew paan (a kind of Indian digestive wrapped in betel leaves) and during His 60 th Birthday, when the ceiling on desires was enforced on the devotees, to be an example for it, He too gave up that habit. RP: Yes! 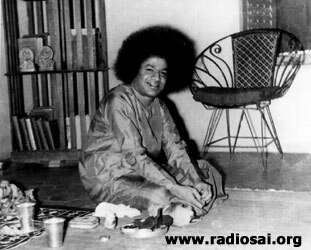 He used to eat paan a lot, but I think on that occasion when the theory of ceiling on desires was evolved, for practical application in all the households of the devotees, He also wanted to set an example and He gave up eating paan. RP: Swami is always like that; first He sets an example and then He wants others to follow. PK: Yes. And my father used it as a vibhuti container and I am fortunate to have that with me now. RP: Oh, so you have that too! RP: You have a small photograph too? RP: So you have that too? RP: That’s great! What else do you have that He maybe gave to your father that you have now? PK: See, we have heard of Swami creating rings, lockets, vibhuti etc. but once, He created a small monkey! Not a real monkey but a stone monkey for my father. Would you like to hear about it? RP: Yes! Please tell us about it because that is very unusual. What was the occasion? PK: It seems one day there was some discussion about the evolution of man - Darwin’s theory - with Swami and some devotees there and since my father was an Anthropology Professor, he was very interested in it. RP: Oh! So he was in anthropology too? I thought it was just history! PK: No! He was in Anthropology too. He was studying it and so he was interested. RP: So he was an expert then? RP: They are the ancestors to man. RP: So there was an argument between the two of them. PK: Then Swami said: “No! No!” and to convince him, He created a stone monkey – it was about 3 inches and it had no tail. And He showed him: “See! It was this type!” father was so astonished! He never knew that; it had beautiful twinkling eyes and it was holding a fruit in its hand. RP: What colour was it? PK: It was a stone; brown colour not dark brown but beige - kind of a biscuit colour. It was sitting with a fruit in its hand and it was without a tail; but the eyes were so expressive. RP: Is that with you now? PK: No. Father said it would be better if it was kept in a museum so that people can see too. If it was at home, then only those who come to our home can see it. So I think it’s in the University Museum. I also have some mementos of letters which Swami wrote to me.